I've already dipped my toes into the Budget Blush realm with the Max Factor Creme Puff Blush, and fallen in love with them for their quality and colour, but I felt it was high time that I tried out some other budget blushes, and when I saw the 3 for 2 offer at the L'Oreal stand, I thought that it was a sign. I picked up the True Match foundation which I've already reviewed, another which is due to be shown off here, and also, the Le Blush in Sandalwood Pink. This blush is housed in the dinkiest packaging ever. Not quite as stripped back as the Makeup Revolution blushes, but then, it does cost a few pounds more. It comes with its own teeny mirror and tiny little brush, which is quite useless in my opinion, so it'll just stay sitting in the bottom layer of the blush packaging forever more. Despite its small size, I'd say that there is quite a lot of product in the packaging. The colour packs quite a punch as well, being a pretty pink that will perk up your complexion. I think it might be a bit too bright for pale skins, and would suit medium toned skins better, giving you a more natural flushed look. I did experience quite a lot of fallout with this though, even using the lightest of touches from my blush brushes, and always ended up with a lot of product on them and blown about, as you might be able to tell from the picture. Now that I've gotten used to it, I know that I literally just have to do the gentlest of dabs from my RMK blush brush to get the right amount of blush for my cheeks. While I've managed to sidestep this issue, I have a major bugbear with this blush, and it's the smell. Oh my. Why on earth did L'Oreal think it was a good idea to make a blush reek of slightly sour candy? In fact, the smell makes me think more of fried tomatoes that have been sprinkled in sugar. Bleurgh. I don't mind a little scent to my makeup, but seriously, this is just so overloaded with scent, it really takes away from a perfectly nice blush. This blush is actually a really nice colour, and one I genuinely would like to use, but I find the smell off-putting to the point that I just think I'll open it and immediately close it again, which is such a shame. Sorry for being a bit down in this review, but I've always found perfumed makeup products a bit hit-and-miss, and unfortunately this one is a miss for me. If you aren't bothered by scent so much, then this colour is a lovely shade to add to your collection and one you should consider. For me, I'll just have to see if there are any other budget blush options that are as good as the Max Factor ones. Do you have any recommendations for me? I'd love to hear them! This looks like such a stunning shade! 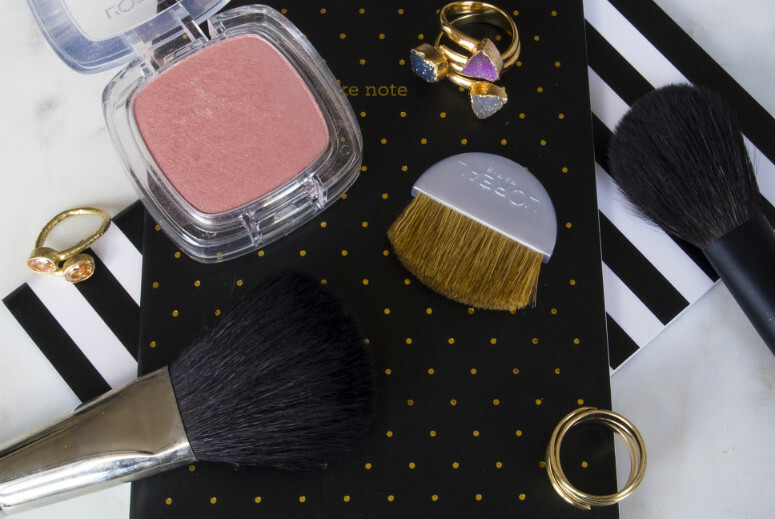 I totally agree though the brushes that come with the blush are always useless! It really is a pretty shade! Such a shame about the smell!